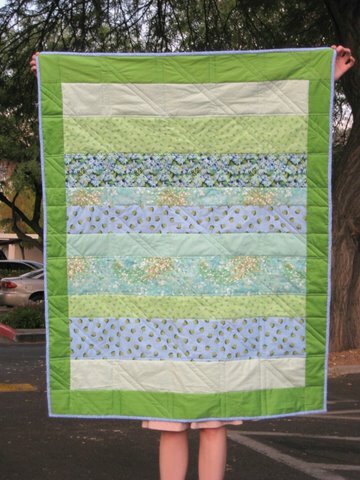 A coworker just had a baby and I finally finished putting on the binding today — one of these times I’ll deliver the quilt before the baby comes. I’m not sure how much time he’s going to take off work, it might be a couple months before he comes back in and I can give it to him. The binding took 5 episodes of “Mad Men” and one of “Bones”, I think. I was sewing only one needle’s worth of thread at a time, though, so if I worked the whole episode I would have finished sooner. 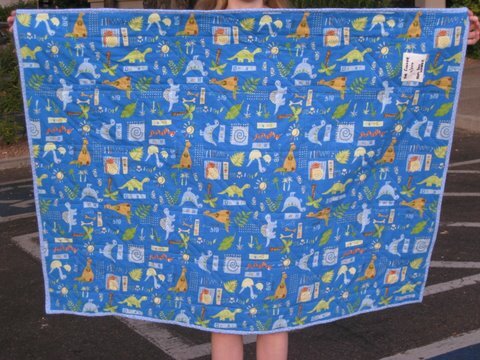 The back is a soft dinosaur flannel. I quilted straight lines in the seams and double lines perpendicular to the stripes, plus some double lines on the diagonal as well. It’s time to buy myself a walking foot for my sewing machine. July 22, 2010. 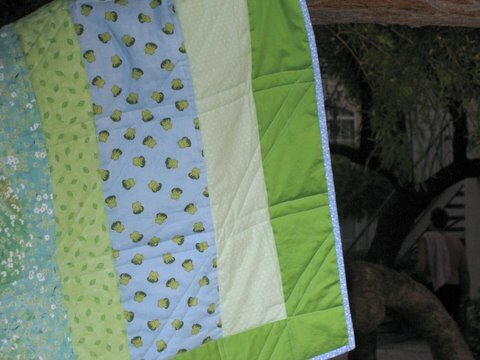 Tags: baby quilt, blue & green, completed project, dinosaur, quilt, stripes. Pictures, Projects, Words. 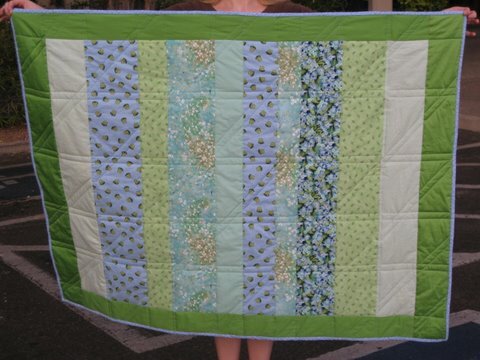 The green and blue edge, and the stitched pattern, looks great. When you come you’ll have to explain how you manage to get it not to puff out or stretch (do you start in the middle and go to one edge, and then the same middle place and go to the other edge? )….lucky baby. July 23, 2010 at 5:54 am. Permalink.